Motivating employees to share and reuse knowledge has always been the holy grail of knowledge management. But what actually convinces people to change their habits and incorporate KM into their daily activities—to join a community, answer questions in an online forum, post and edit content, or search for lessons learned? Over decades of experience, we’ve found that a mixture of impassioned leadership endorsement, top-down and grassroots communications, training, change management, incorporation into policies and processes, tangible and intangible incentives, and positive reinforcement is necessary to move the needle. Formal support and recognition are particularly important if the organizational culture has not historically valued openness and collaboration. Good knowledge managers are continually making the case for KM to employees, both directly in meetings and conversations and indirectly through branding, email, and corporate communications. But as you talk to current and potential participants, you need to know what messages are most likely to persuade them. Data from APQC’s just-released Promoting Knowledge Management and Making It Stick survey can help you think through the right points to underscore. APQC’s knowledge management metric of the month focuses on the positive outcomes that convince employees to share and reuse knowledge. The most commonly touted benefit, with 60 percent of survey respondents listing it among their top three, is the time employees can save when looking for information or supplying knowledge to others. But organizations convey a wide range of benefits, from cycle time reductions to better, faster decision making. Time savings is a key outcome of good knowledge management and a big reason to invest in KM. This message resonates because almost everyone has experienced the frustration of looking for information they know is there, but just can’t find (or don’t have access to). And all that wasted clicking and searching adds up: According to the IDC, the average knowledge worker spends 6.5 hours of every work week looking for information—and doesn’t find what they need 44 percent of the time. Both leaders and rank-and-file employees can appreciate the advantages of streamlining access to knowledge and minimizing wild goose chases. And it’s important to recognize that time savings accrue to information givers as well as seekers. Managers, subject matter experts, and others who repeatedly respond to the same questions or requests can reduce the burden on themselves by transferring that knowledge to others or documenting it in a repository, wiki, or forum. Contributing knowledge requires a small upfront investment of time, but it can pay huge dividends over the long term. A significant percentage of organizations also emphasize opportunities to improve productivity and quality by applying best practices, learning from past mistakes and lessons, and reusing intellectual property across teams and projects. While these are laudable outcomes, the danger is that the arguments can come across as abstract. Employees may see the benefits as “nice to have” or struggle to see what’s in it for them. Productivity and quality actually drive a variety of organizational measures, including many that appear in employees’ performance goals and scorecards. The key to emphasizing productivity and quality gains in your messaging is specificity: Your audience needs to understand exactly how KM can support their individual goals. For example, if you’re encouraging project managers to document and review lessons learned, you need to spell out exactly how the lessons learned process can help them deliver projects on time, on budget, and with positive customer satisfaction ratings. This is an area where success stories and examples come in handy to drive home your point. The data is also revealing in terms of the benefits organizations are not currently emphasizing. 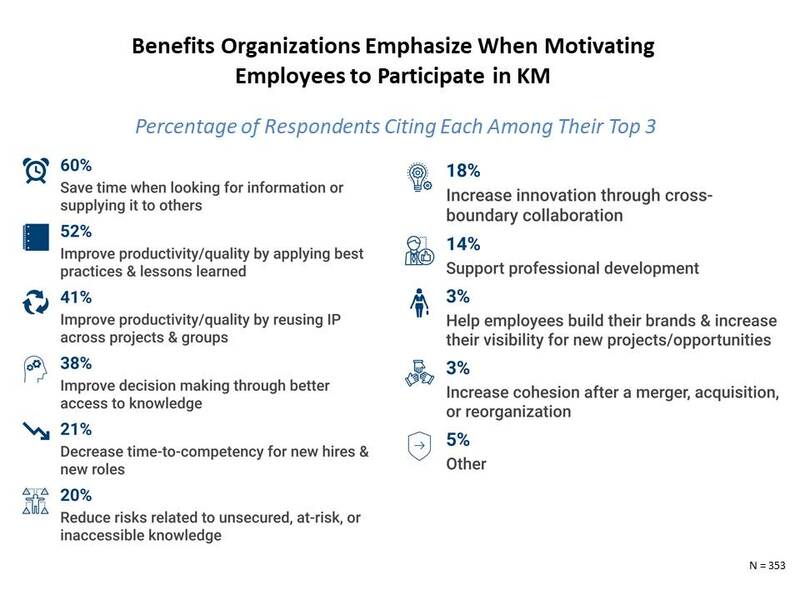 For example, only 14 percent of respondents focus on KM’s role in employee learning, and only 3 percent talk about KM as a way for people to build their internal brands and increase their visibility for new projects and opportunities. This failure to link KM to professional growth and development feels like a missed opportunity. When employees leave their jobs, they often cite better training and career prospects as reasons why they are taking the leap. 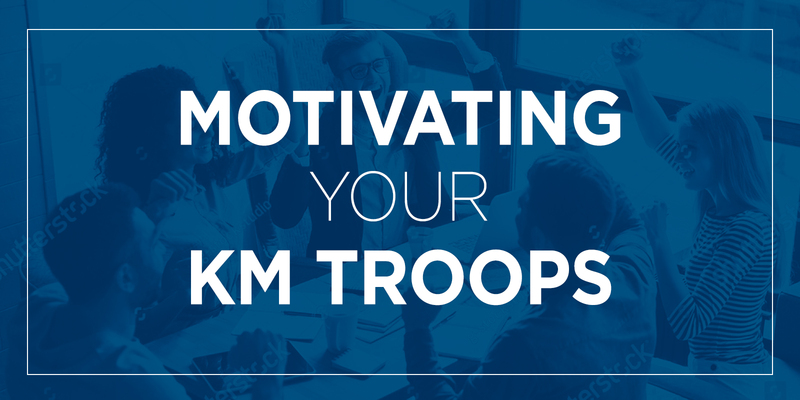 KM has the power to connect people to resources to help them learn and grow, as well as experts and mentors to share tacit knowledge. Furthermore, communities of practice, enterprise social networks, and expertise locators are great vehicles for employees to demonstrate their competencies and expertise while assisting colleagues. If the organization positions KM as an avenue to develop and demonstrate a person’s individual knowledge, that can go a long way towards encouraging active participation. APQC members can get the latest data on motivating KM participation in APQC’s Promoting KM and Making It Stick: Survey Summary, published today. It's interesting to see which kinds of messages are the most frequently-used - - but do we have any feel from this as to which are the most effective ones? I agree with the observation that the language and themes are rather 'corporate' rather than appealing to the personal benefits for the individual - which I suspect could be rather more effective. As we move forward with this research, we’ll be conducting correlation analysis to identify the messages emphasized most by effective KM programs. But you’re right: we’ve seen repeatedly in our research that you need to address the KM value proposition from multiple levels. It helps to explain how KM will benefit organizational outcomes and KPIs, especially when communicating with senior leaders. But employees also need to know how KM participation will help them succeed in their current roles, free up their time for value-added work, make them more visible outside their team/department, and allow them to build their career or legacy.